Another Tuesday, another remote pairing session with a new person. Ben had carefully picked out an open source plugin for Python flask (micro-web system) that was related to the closed source work he had been doing. Their server needed to provide cookie support for some clients and Oauth for others. This mean they wanted Cross-Site Response Forgery (CSRF) support in some instances and not others. Ben had made the necessary modifications to his fork of the flask plugin ‘seasurf’ and had solved the issue for his main project, but his pull request to introduce the changes into the main seasurf project had been turned down due to errors flagged by the CI system. While everything was working fine in Python 3.6 it seemed that some older versions of Python were seeing test failures. Ben had pointed out that the project had similar failures on its master branch but there hadn’t been any follow up, and so we were planning to dig into these errors to look for a solution, so that ultimatley the change could be merged into the main project and Ben could remove his fork as a dependency in their production system. We checked that Ben’s change seemed to have reliably fixed the test in Python 3.5 by dint of running the tests 5 times and not seeing any intermittent failures. 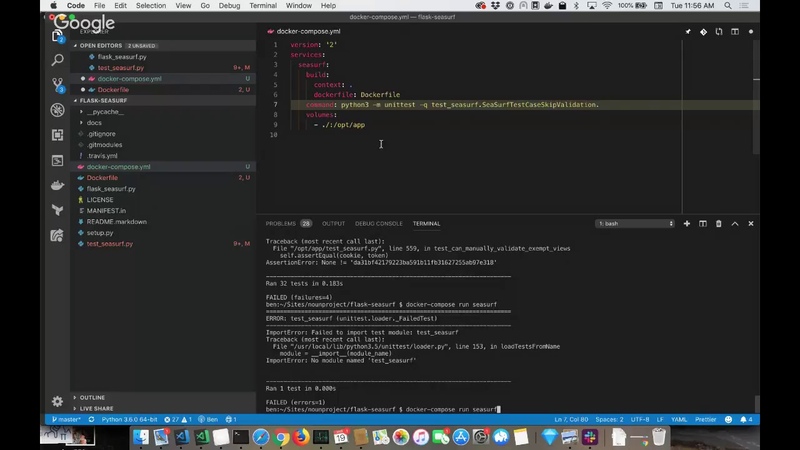 I had access to Ben’s editor via a VSCode Liveshare and so I was able to highlight bits of code I was talking about as I tried to follow what was going on, so then I tried some very minor refactorings but didn’t really add anything, apart from speed replacing the several instances of getCookie throughout the test file. It was crying out to be DRYed up into a single location, but in the interests of time and ensuring our pull request would be simple we demurred. Ben went further suggesting putting in a PR to just fix the main branch errors first before trying again with a PR for his new functionality. An approach that took into consideration the person who would be reviewing the PR and potentially merging it. This met with double thumbs up approval from me, and that approach bore fruit the following day with a PR being merged in, and Ben followed it up with a second PR that added the new CSRF skipping functionality that was able to go green and was also merged in the following day. As the week before we’d started the pairing session using a google hangout link shared via Slack, but in contrast to the pairing session with Bryan we’d not used github pong at all, and in fact not committed anything via git as part of the session itself; but that had all worked just fine. I added an issue to the repo about the need to DRY out the getCookie method and the maintainer gave that a thumbs up and flagged as help wanted and good first issue so we’re all set up for a follow up session.